Stuck interning with the local Amish community? Or do you find that the simplicity of grinding beans by hands delivers you to a state of zen? Whatever your reason, the simplicity of a manual grinder is something to be sought after. Manual grinders are believed to retain more flavors of coffee because the grinding process produce a minuscule amount of heat. They’re also much less noisy if you’re regularly the first person awake and preparing coffee. There’s many pros and cons to consider when purchasing a manual grinder, so let’s review the top picks for 2018. 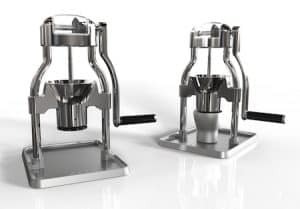 JavaPresse has created a manual grinder that simply feels different than most hand grinders. There’s something about the way the dual plate system holds one of the burrs completely stationary thus securing it against the other burrs while the other spins with the crank. Javapresse says this was done in an effort to control consistency, but also makes for an enjoyable grinding experience. The JavaPresse Manual is designed with an adjustment knob underneath the burrs to accomplish all of your grind setting needs. This coffee grinder is not only compact, but can be taken apart easily to further save space. If you’re looking for a grinder that’ll cater to capacity but is still compact enough to take camping, then this is a manual grinder that fits those demands. 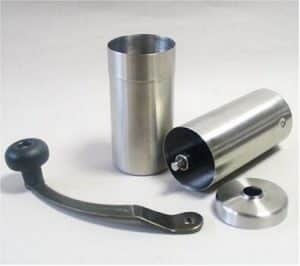 This is a grinder constructed of high grade stainless steel and ceramic conical burr on the inside so there is no need to worry about damaging it with rust. 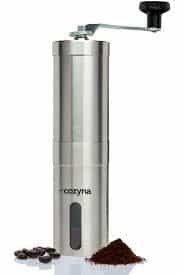 The Cozyna grinder is very sleek and compact, it’d look great on the countertop or sitting beside you on a mountaintop. 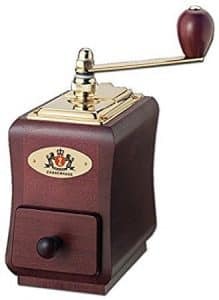 The selling point here is the ability to hold the Cozyna coffee bean grinder with ease, it’s comfortable and very easy to hold in place while grinding coffee, and with ceramic burrs the job is done quickly. Certainly one of the more affordable hand grinders on the market, and still a great build. You’ll likely enjoy the visual process of grinding as well. The Shanik is made specifically for outdoors enthusiasts, it’s got a built-in adjustable grind selector that ensures you have the exact coarseness you desire. Simply turn the knob clockwise or counterclockwise in order to reach the perfect size for your specific coffee drink. A Silicon grip has been added to the grinder for better handling too. One major feature that many will like is that the measured container ensures a precise brew. 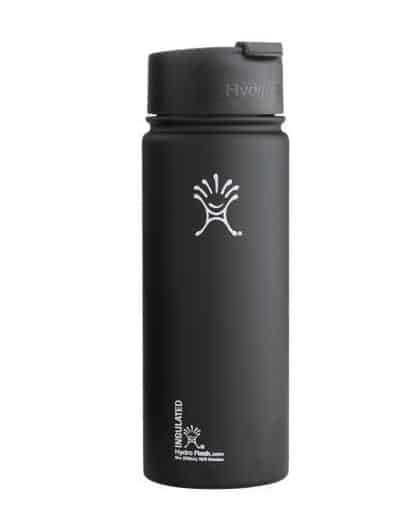 A silicone lid is included in order to keep the remaining ground coffee fresh inside and gives you the option to grind now and enjoy while you’re on the go. 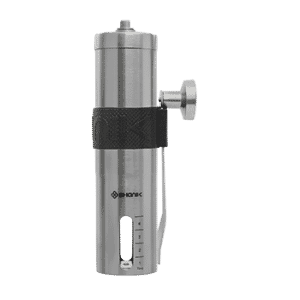 The Shanik Manual Grinder is easy to breakdown and clean, preventing buildup of oils and debris. 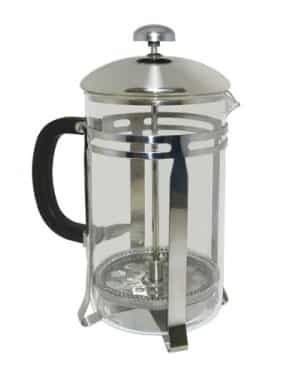 It’s perhaps this aspect that aids to the overall portability of it, and makes it an excellent grinder for scaling cliffside, coffee on a mountain top or overall adventuring that requires being caffeinated. The Handground manual ceramic burr mill comes equip with a whopping 15 grind settings. This means basically any brew method can be achieved, from very coarse to espresso fine. Though most hand grinders haven’t been able to achieve super fine for turkish coffee, you’ll come close with this grinder. What sets this grinder apart from the rest of the market is the ability to choose a setting and use it again and again, replicating a grind that you found prior. The HandGround is simple and consistent, some say it’s on par with a great electric burr grinder. That’s probably thanks in large part to the 40mm conical ceramic burr mill in combination with its triple mounted axle that was developed to eliminate burr wobble. The apparatus looks great, and doesn’t have much of a footprint if you’re for storing on the countertop, or among your brewing arsenal. It’s on the larger end of the grinders on this list, but that aids to it’s large hopper, for more quantity of grounds in a session. Mahogany beech wood graces the construction of this beautiful manual coffee mill. Zassenhaus is a company that began in 1867 as an export store supplying small steel goods and hand tools. Then in 1904, they began focusing more on pepper mills. Obviously you how that trend led them further into the grinding worlds as they are now among the leading manufacturers of manual coffee mills. 150 years of experience has allowed them to create a grinder with interesting features that are tried and tested. One can adjust the grind by turning the knurled adjustment knob located below the crank, simple yet efficient and classy. Easy open drawer pulls out to provide perfectly ground coffee. The Zassenhaus Santiago isn’t a portable grinder by any means, but is rather a small manual grinder that is as beautiful as it is functional. 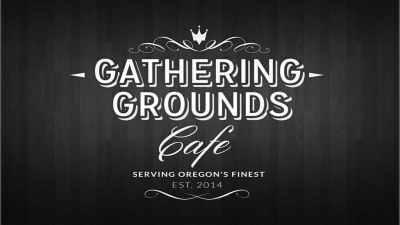 It feel like owning an antique piece of coffee lore, and we believe it to impress a certain milieu of coffee history upon whomever you’re entertaining. Hario means “The King of Glass” in Japanese. Thus one should certainly trust the glassware that this hand grinder features to be of high quality durability while maintaining being inexpensive. 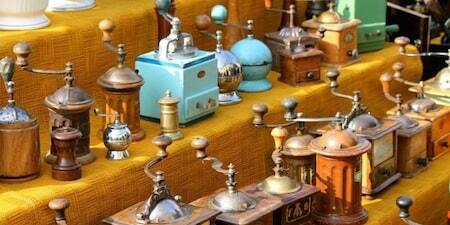 Hand coffee grinders are the direct victims of your excursions. They need to be robust and strong. Despite the fact that this might be easily broken while backpacking in the Rocky Mountains or on rough terrain, it’s a rather great addition to your suitcase if you also have a phobia of hotel coffee and are looking for excellent grinds on the road. I get the feeling this was engineered specifically for the traveling business person. 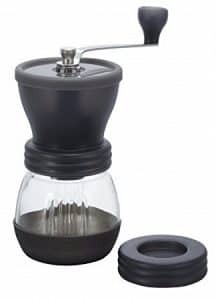 The Hario Skerton is ergonomically design impresses upon the user as the nonslip rubber base keeps the mill in place during grinding, and crank handle is easily detached for storage. Hario knows their users and what they require from a hand grinder. It’s just the sort of attention to detail you can expect that drives this company forward. If you’re armed with only an Aeropress, a bike, and some coffee beans then the Porlex is going to be the next item on your to-go list. 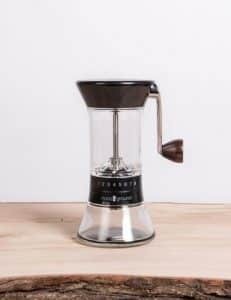 Not only is it engineered to grind straight into an Aeropress, it’s optimum for travel with a lightweight steel frame that barely exceeds nine ounces. It’s easy to take a cruise to your favorite spot and enjoy a fresh brew wherever you please. If you’re looking to travel on foot, by bike, or maybe even ski, then the Porlex JP-30 is the grinder to bring… hopefully you’ve got a thermos of hot water, or maybe there’s some waiting at the destination. 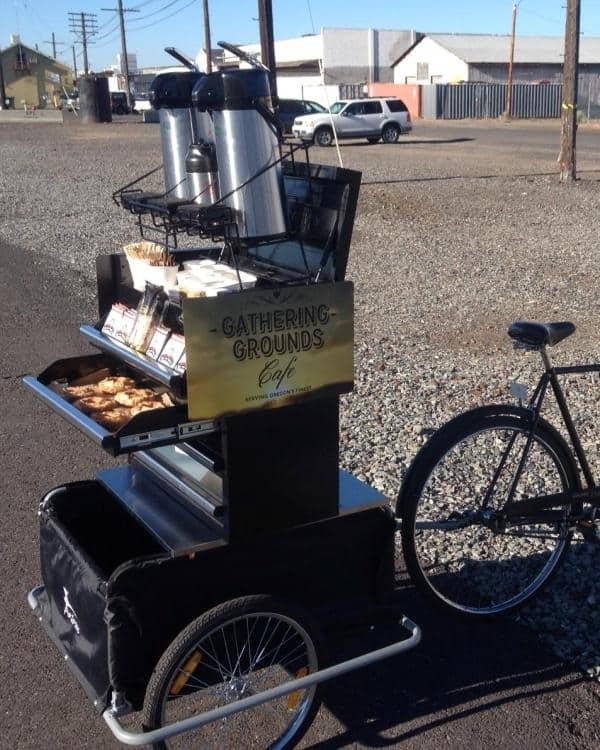 Regardless, this thing can grind enough coffee for two cups at the same time, so bring a friend! This one looks much different than the score of other manual grinders we’ve reviewed thus far. It’s not particularly antique and it’s not a terribly compact grinder either. The ROK coffee grinder is constructed mostly of stainless steel right down to the 48 mm burrs. So, this isn’t the most compact grinder on our list but it’s the efficiency and durability that set it apart. 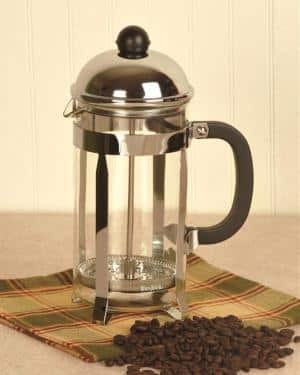 It looks great on a countertop as well, and the Italian-made steel burrs can crush through an ounce or more of coffee in a few swift turns of the handle. The size of this grinder also lends itself to the amount of coffee one can prepare in a flash. This is the grinder for a larger gathering that requires coffee quickly, quietly, and without the addition of damaging heat. This is likely the Lamborghini of the manual coffee grinders, and the price shows that, but it’s reflected quite well in the consistency of the grinds and the sleek look. It’s truly original and worth investigating if you need electric grinder-quality without the sound and price points. Once thought to be antique and out-of-date, these devices have made a comeback in the specialty coffee world due to their versatility, reliability, and minimalist appeal. Hand coffee grinders give you the best of grinding styles by offering a consistent grind for a fraction of the cost. 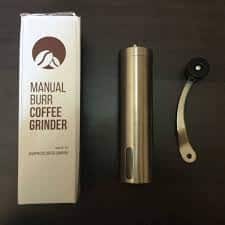 Hopefully one of the manual grinders we’ve shared will meet your needs, feel free to check out the rest of our fine coffee gear here.